The series is The Prose Bowl. It evokes competition, since that’s our basic format, but is also a pun, because we’re a tongue-in-cheek show and also have a running gag wherein I love puns. Because I do! I founded it with a guy named John Hague. We currently run it together. The medium is live performance primarily, though we recently expanded to include a podcast (which features recordings of readings from the show, but also other original material) and a print anthology of monthly winners and other work from people involved with the show. In terms of genre we are mostly for fiction writers, though we’ve had one or two memoir pieces. As long as it’s prose we have a place for it. The format is an open mic, and also a competition. Writers sign up to perform for five minutes, after which a panel of judges gives feedback. The judges pick two finalists who then perform very short (tweet-sized) stories. Audience applause determines the winner, who gets a (silly, often impractical) prize and a free drink. In order to downplay the competitive aspect (and encourage otherwise nervous first-timers) we embrace a sort of jokey take on American Idol. The series is once a month, third Tuesdays at 6:30 PM, at Pete’s Candy Store in Brooklyn. Starting in June we are probably moving to a 7 PM time slot. The series has been active since August of 2015. People can find information at our Facebook page and website, as well as on Twitter. Various sites such as Brokelyn, Nonsense NYC, and Greenpointers also have us on the calendar. We are very strictly an open mic. We do not take submissions or solicit. Writers need only come and put their name in a hat, regardless of genre, publishing history, or any other criteria. Did you set out with specific goals when the series was launched and have they changed over time? What distinguishes the series from others? Really the last three questions are all related. We did set out with specific goals which we have remained with steadfastly. The show is intended to fill a niche for writers who are serious about their craft and want to perform or get their work out there, but would otherwise have no opportunities to do so. Although New York is brimming with reading series, as far as I’ve found you must 1) be published, 2) be in a university program or other academic setting like Gotham or Sackett Street, or 3) be a member of a club like Paragraph or Brooklyn Writers Space in order to be eligible. The Prose Bowl offers an alternative venue for anyone who can’t afford what is, essentially, a price of admission. We do this partly to encourage diversity in the city’s literary scene, and partly to adhere to the vision of New York that writers come here with—as a place where literally anyone can get their shot. So what sets it apart is partly a stable of truly emerging writers, people who have talent but may not have placed even a single short story in a journal yet, as well as our format, which includes elements of competition and stand-up comedy. Readings themselves are quite briskly paced, and we include audience participation in the form of declaring a winner. Whether or not a writer ever finds success as a result of being on our show, the idea is to let them know what it feels like to truly entertain with their work, rather than just passing it around to indulgent friends and family. It also aims to make the experience of a reading exciting for a wide variety of audience members who may not necessarily frequent events of that type. 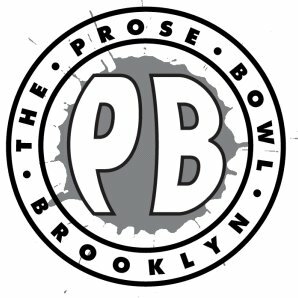 Prose Bowl takes place on the Third Tuesday of the month at Pete’s Candy Store. The next event is scheduled for Tuesday, August 16, 2016.